Pressure Relieving Bath Mattress For Bathing Comfort. 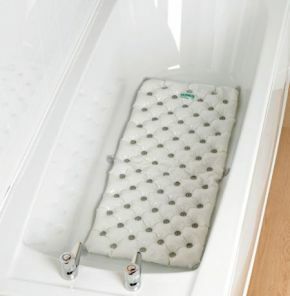 A pressure relieving bath mattress designed for those who find a hard bathtub uncomfortable (including those suffering from excessive weight loss, pressure sores, and the very frail), this product provides support under bony areas where it is needed most. It's filled with a special gel that won't melt away underneath the user, and covered with a soft material that will help prevent sheer strain. It's important that a bath mattress stays secure in place, and this specialised pressure-relief bath pad is no exception. It's fitted with suction cups at the edges for safety and peace of mind. This is an excellent product for my Dad who is very frail and suffers a lot of pain due to illness, Although it seems pricey it is well worth every penny to see my Dad enjoying a warm bath and being comfortable whilst doing so .